A man in a Hawaiian shirt took matters into his own hands in Edmonton on Friday after an alleged arsonist was seen lighting cars on fire. 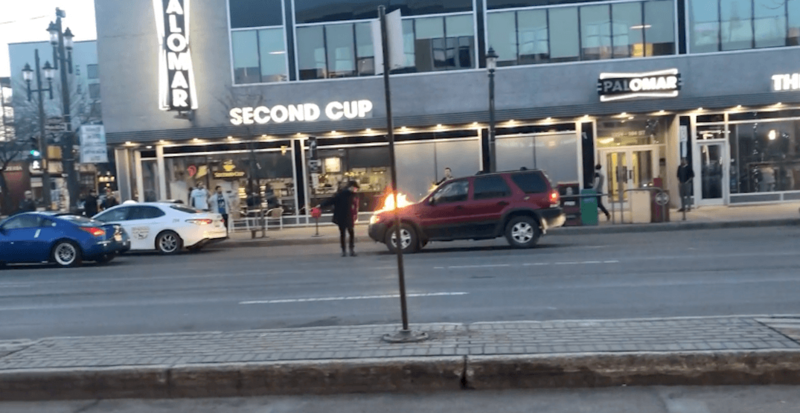 The suspect, who can be seen in a video posted to Reddit by user u/spincrisis, is shown walking across an Edmonton street lighting an occupied vehicle on fire with what appears to be gasoline. After abandoning his gas can and walking into a Starbucks, a man in a Hawaiian shirt can be seen following him into the coffee shop, tackling him, and pinning him down with a few other men — including one holding a 2×4 — before police arrive a few minutes later. According to a release from the Edmonton Police Service, a 22-year-old man has since been charged in relation to multiple reported vehicle fires near Whyte Avenue. “At approximately 8:40 pm, Friday, April 12, 2019, police responded to the report of multiple vehicles on fire in the area of 104 Street and 83 Avenue,” the release stated. Police noted that no citizens had been injured as a result of the incident, but that a total of 13 vehicles were damaged. The suspect, identified in the release as Malice Sutton, is now facing charges including eleven counts of arson to the property of others, three counts of arson to property (disregard for human life), four counts of possession of incendiary material, and one count of assault with a weapon. Social media users have since praised the man who has been nicknamed “Hawaiian shirt guy,” likening him to fictional superheroes. “Not all heroes wear capes, some wear Tommy Bahamas,” one Reddit user commented, while Twitter users were quick to turn the man (and his signature shirt) into a meme.